High-speed can mean a lot of things to different people; one man’s fast can be another’s pedestrian. There are cameras available that can capture pretty much even the most fleeting of transient events – MIT demonstrated a camera that could image at a trillion frames per second, fast enough to record the movement of light. Anything upwards of 30fps might be considered ‘high-speed’, but generally the term refers to hundreds – if not thousands – of frames per second, with 500fps giving good slow-motion sports footage, while 50,000fps might be used to slow down a bullet fired from a gun. There are a range of speeds and a range of uses, from ballistics studies and automotive crash testing to fault-checking on high-speed production lines. 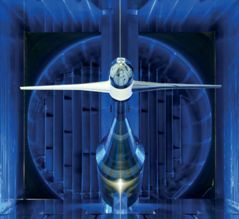 At the European Transonic Windtunnel (ETW), located in Cologne, Germany, high-speed cameras are currently being tested with an aim of measuring the dynamic deformation of aircraft components. ETW is one of the most advanced aerodynamic test facilities in the world, capable of simulating high-altitude and high-speed flight conditions. By installing high-speed imaging equipment, the engineers hope to be able to measure the frequencies at which aircraft components oscillate under flight conditions. The stereovision system will image deformations in the component by tracking the 3D coordinates of up to 40 markers positioned on the model. The markers are placed on the leading and trailing edge of model components, such as aircraft wings or flaps. ‘Inside the wind tunnel the model is pitched to different angles of attack according to the specification defined by the client. A range from negative to typical landing conditions can be achieved,’ says Jennifer Mantik, a research assistant at ETW. This might be applied to half-models of components mounted on the ceiling of the wind tunnel or full models, which are mounted on a supporting system and rolled and rotated on a lateral axis, depending on the desired test conditions. The facility is already using imaging systems developed by the Fibus research institute based in Hamburg, Germany, to measure aerodynamic and aeroelastic effects on aircraft components. The new iteration of Fibus’ PicColor Stereo Pattern Tracking (SPT) system uses two Bonito high-speed cameras from Allied Vision Technologies (AVT), with a frame rate of 386fps at a resolution of 2,240 x 1,728 pixels. The system can reach around 1,000fps at half the image resolution, which allows deformations to be assessed at frequencies of 500Hz. Models inside the ETW aren’t tested in an air stream, as is the case in conventional wind tunnels, but in a flow of pure nitrogen with temperatures down to -163°C. The pressure can reach 4.5 bars and the wind speed can be in the low supersonic range. Mantik comments that the cameras have yet to be tested under high-pressure and cryogenic conditions. The high-speed system will be triggered separately via a National Instruments card, but Mantik says the images have to be synchronised with all the other measuring systems to provide high-quality data. Mantik is also experimenting with data transfer. The distance from the test section to the main tunnel control room housing the PCs is around 100m, with the data transferred via fibre optics. ‘We don’t have experience transferring such a huge amount of data over these distances, so the system will be tested completely at first at ambient, and subsequently at cryogenic, pressurised conditions,’ she says. The current SPT imaging systems measure bending to an accuracy of 0.1mm and twisting to 0.1 degrees. Mantik expects the Bonito high-speed cameras to provide even higher measurement accuracy. The sensitivity of AVT’s Bonito camera is excellent, but even so Mantik says that illumination was carefully considered when developing the imaging system due to the very short exposure times. Mantik also reports that, with the current system, the cameras record darker images under high pressure. The ETW will use high-power LEDs to illuminate the models sufficiently for recording at 1,000fps. Lighting can be a problem when imaging at high speed; the faster the frame rate, the less light is available due to the short integration time. Consequently, powerful LEDs and lasers are often used – but, on some occasions, light intensity is limited. Jonathan Adams, sales engineer at Hamamatsu, explains: ‘For some high-speed applications, you can use a brighter light source, but for others it is just not possible.’ He gives an example of one of his customers, which installed an open inspection system on its manufacturing line. Here, the light intensity had to be eye-safe, so very strong illumination was not an option. In this instance, a time delay integration (TDI) camera was used – which, Adams says, is ideal for these types of high-speed imaging applications. Hamamatsu’s TDI line scan sensors are back-thinned CCDs, with up to 128 stages. As each part of the object moves past each line, the sensor transfers the charge from one stage to the next to effectively sum the signal and make the CCD more sensitive. ‘Some CMOS sensors are incredibly fast, operating at tens of kilohertz line rate, but in some applications where there isn’t enough light, these sensors are not suitable,’ Adams says. Hamamatsu offers 50kHz and 100kHz TDI sensors, with the 100kHz version having a resolution of 4,096 pixels. In colour imaging the illumination issue becomes even more acute, as the light is separated into three colour bands, red, green and blue. 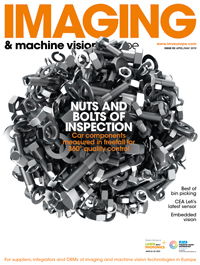 The printing industry uses fast colour cameras for quality control and, according to Xing-Fei He, senior product manager at Teledyne Dalsa, print inspection speed is likely to increase ‘to maybe double or triple the line rate within the next one to two years’. To give an idea of the speeds reached by current printing machines, a Rapida 145 printing press from Koenig and Bauer can print 1.05 x 1.45m sheets at a rate of 17,000 sheets per hour. Teledyne Dalsa’s Piranha line scan colour camera is part of the quality control unit, scanning the sheets as they are printed and feeding the data back to the machine’s ink duct to ensure the colour density remains consistent throughout the print run. Teledyne Dalsa has recently launched a new Piranha colour camera – Piranha4 Color, a trilinear CMOS camera with a 4k resolution running up to 70kHz. It provides four times the speed of the previous Piranha colour camera. With the print industry demanding even higher speeds, Xing-Fei believes TDI technology will be required for colour imaging ‘in the next few years’. Teledyne Dalsa developed its TDI technology over 20 years ago for monochrome cameras, but the technology isn’t available for colour cameras yet. In multi-camera high-speed systems, even transferring the data to a PC becomes a bottleneck because of the volumes of data. IO Industries produces recorders targeted at high-speed imaging. ‘Multi-camera systems will generate terabytes of data. It’s very difficult to record that reliably with a Windows OS-based PC system,’ says Andrew Searle, global sales manager at IO Industries. The company’s DVR Express Core high-speed video recording system is hardware-based and streams video directly to non-volatile solid-state storage. It can record at 700MB/s and store 2TB of data in standard configuration, with extension options approaching 15TB. Searle says IO Industries’ hardware-based recording approach ensures that footage is captured reliably, which is critical in many high-speed applications: ‘Often the events captured, whether it’s automotive testing or military range testing or scientific experiments of any sort, the tests tend to be expensive to prepare and cannot be reproduced very easily.’ In automotive crash-testing a vehicle can take weeks to prepare and install all the sensing equipment – Volvo Trucks, which has used high-speed cameras from NAC Image Technology, quotes two weeks as a timeframe to prepare one of its HGVs for crash-testing. The work undertaken at the European Transonic Windtunnel is similarly precise and requires reliable imagine equipment, which is why the new system is undergoing extensive trials to ensure it is accurate before it is used to capture real data. Infrared cameras can’t image at thousands of full frames per second, but they can still reach reasonably high speeds. Armstrong Optical has developed a line scan infrared system imaging a brake disc rotating at the equivalent of 400km/h. The camera runs at 10kHz frame rate, and the image capture is synchronised with the rotation to read out a complete image of the disc and measure temperature changes as it rotates against time. The camera is positioned looking straight down onto the brake disc, with mirrors set up to image both sides of the disc simultaneously. Infrared cameras are either cooled or uncooled. The uncooled systems can’t operate beyond a cycle time of around 4ms, says Johnstone, because they require a finite integration period where the array is read out line by line. Cooled systems aren’t microbolometer arrays but photon detectors made usually of indium antimonide (InSb) or mercury cadmium telluride (HgCdTe), and which operate in snapshot mode. Here, the whole chip is read out in one go allowing for much faster frame rates, he says. Armstrong Optical’s top of the range cooled camera can run at full frame of 1,280 x 1,024 pixels at over 100Hz, and much faster at sub-frames. The current World Land Speed Record stands at 763mph – set by Thrust SSC in 1997, which broke the sound barrier. Now, the team behind Thrust SSC are building a new supersonic car – Bloodhound SSC – which, they hope, will reach 1,000mph, faster than a bullet fired from a Magnum 357. The car – and it is a car, because it has four wheels and is under the control of a driver – is still being built, with UK runway tests (up to 200mph) planned for early 2014 before the team travel to the Hakskeen Pan desert in South Africa for high-speed testing. The project is not just to break the land speed record, but it’s also a demonstration of British engineering; all of the components that go into the car are provided for free in return for publicity. Stemmer Imaging is contributing the in-car video system, which will consist of up to 11 cameras recording at various speeds all looking at different aspects of the car. Stemmer will be using some of the latest CMOS sensors that can be windowed down to approach 1,000fps. Williamson also says that an Optronis camera, which can reach around 5,000fps, might be used on the car during its development. ‘All the testing data will be published during the trials,’ he says. ‘We’re currently putting together the system, which will be very small, highly embedded processors taking up to 11 GigE camera feeds. ‘Gigabit Ethernet is not a particularly high speed interface, so we’ll be recording the data in Raw Bayer and doing the conversion in the processor.